The Quesnell Bridge is the busiest bridge in Edmonton, with approximately 120,000 vehicles per day and 4,000-5,000 pedestrian and cyclist trips per week. 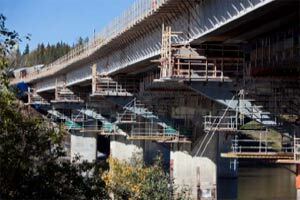 Completed in 2011, this is the first major rehabilitation/widening of the bridge since it was built in 1967. The $161 million project to replace all bridge components (girders, trusses, deck, pedestrian bridge) and widen the roadway has extended the life of the bridge by up to 50 years. At 97 years old, the bridge needed major repairs, including replacement of the road deck; replacement of old-style rivets with modern, high-strength bolts; repair and replacement of damaged trusses; construction of a new widened wooden sidewalk; and a completely new coat of paint. The $18 million bridge project was completed in 2010. The intersection at 23rd Avenue and Gateway Boulevard / Calgary Trail serves over 100,000 vehicles per day, and was rated one of the most congested and collision prone intersections in the city. In 2007, construction began on two bridges that would take 23rd Avenue traffic over Gateway Boulevard and Calgary Trail (as well as the railway tracks), and allow for the free flow of traffic beneath. All structures were opened to traffic in September 2010, with the final paving on Gateway Boulevard and Calgary Trail completed in 2011. The overall cost of the project was $253.7 million. 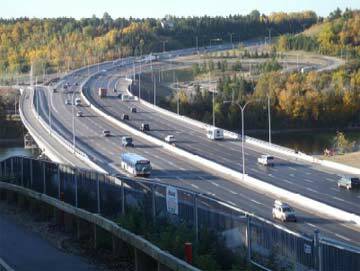 The City is constructing an interchange at Whitemud Drive and 17 Street to provide free flow travel on Whitemud Drive and Anthony Henday Drive. The overpass helps accommodate increasing traffic volumes and improves vehicle and pedestrian safety. The interchange construction is scheduled to be completed in 2012 at an estimated cost of $34.5 million. The Transportation Master Plan promotes healthy and active lifestyles to encourage a shift in transportation modes away from single occupant vehicles to active, sustainable transportation.